Prosecutors are due to submit a legal request to see the details of the ruling on the black leopard poaching case involving construction tycoon Premchai Karnnasuta of Italian-Thai Development Plc. I wonder are they doing the right thing? Or are they just playing another act in the drama "we pretend to do justice"
Thungyai Naresuan Wildlife Sanctuary chief Wichien Chinnawong said today that, while he respects the verdict of the Thong Pha Phume provincial court on Italian-Thai Development boss Premchai Karnasuta, he believes the billionaire deserves a heavier penalty. Speaking at a panel discussion jointly organized by the Seub Nakhasathien Foundation and environment reporters’ club today, Mr. Wichien said he and his immediate superior, Mr. Chaiwat Limlikitaksorn, director of the 10th Conservation Area Management Office, had discussed the 16-month sentence handed to Premchai and both agreed that the verdicts and/or punishments should be appealed. However, they say they want to study the full text of the court’s verdict first. 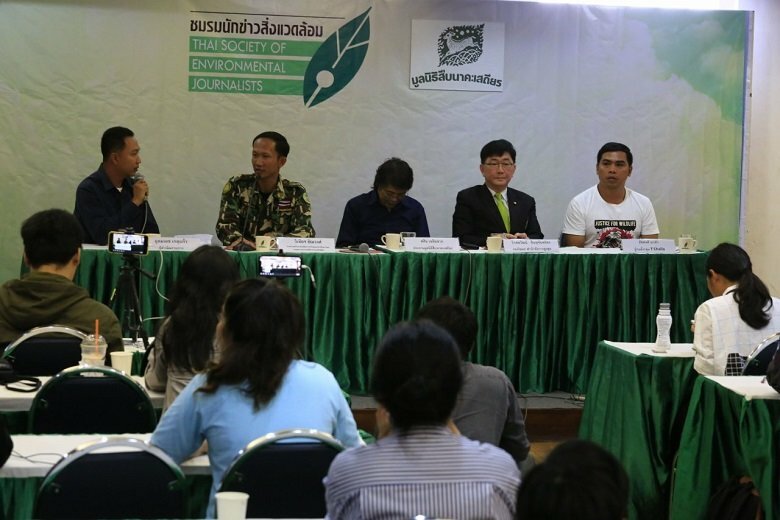 The wildlife sanctuary chief, who arrested Premchai and his party, said that all big cats in Thailand’s wilderness have tremendous ecological value, much more than the two million baht compensation demanded by the court. said today that, while he respects the verdict of the Thong Pha Phume provincial court on Italian-Thai Development boss Premchai Karnasuta, he believes the billionaire deserves a heavier penalty. It is his right to appeal like any other citizen, and if he had any ethics or thoughtfulness, he would not have killed those animals. He is just like all the other Thai elites. They just do not give a dam_ about anyone else. They make messes and expect to be looked after. I believe the latter.....Premchai would surprise if he was actually imprisoned. Ah, the old "Appeal a conviction under the guise of wanting to get a tougher conviction, and then succeed in getting the conviction overturned but fail to get the thougher conviction" card. I assume, sadly, that this is nothing more than a fight between rival business operations and has nothing to do with wildlife and poaching prevention. That is just the charge, they were able to nail him for. If he ran down a som tom seller with his BMW, they would have used that. Construction tycoon Premchai Karnnasuta of Italian-Thai Development Plc. has enemies and rivals. The end result could be his constraction contracts gets invalidated and then thrown open to other bidders. If that happens we see true motives. Or Perhaps this is nothing more than a pre emptive strike in the project to link Don Mueang airport in Bangkok, Suvarnabhumi airport in Samut Prakan and U-Tapao airport in Rayong. It would be great if it was about Wildlife...its not. The ruling proves no such thing. He is not yet in jail and chances are he won't be. He will exhaust all his appeals over many years, and then he will become too ill to serve his sentence and after having built himself a sympathetic judge his sentence will be voided on humanitarian grounds. This scenario is exactly possible because he is rich, it's not available to the poor. So, Wichian, it's not the ruling that counts, it's what come afterwards in this Thai Judicial Leopard Soup Opera. Give it up boys, he’s rich and has no reason to fear the legal system. Should have waited for them to put some mushrooms in the pot... he'd have been looking at some serious jail time then !!!!! And his driver has already taken the blame for the leopard. He is only responsible for the pheasant. The sentence was a joke and the judge is enjoying a windfall. Hopefully these prosecutors aren’t in on it too and have some nuts.